Today I went to a watercolor exhibition in Madrid at the Sala de Exposiciónes Esteve Botey de AEDA. (Agrupación Española de Acuarelistas). You can click here to find out where it is if you would like to go; it was excellent! Aracili Hamilton in front of some of her watercolors. Her colors and line are very natural. Carmen Duran in front of her paintings, this body of work represented different seasons of the year. Here is another view of Carmen Duran’s Watercolors. Manuel Alpañés showed beautiful paintings of Andalucía as you can see behind him. Antonio Arcones in front of his magical looking paintings; they have a special kind of light that draws you in. Javier Fuentes in front of one of his paintings. He had a variety of colorful paintings of different themes and sizes. Here are some more of Javier Fuentes’ paintings. This wall has a painting of José Benito Orduña; it’s the painting of the harbor. I’m missing one Artist here, José Benito Orduña. I wasn’t able to get a picture of him next to his pieces; however, you can see his work here by clicking on his name. 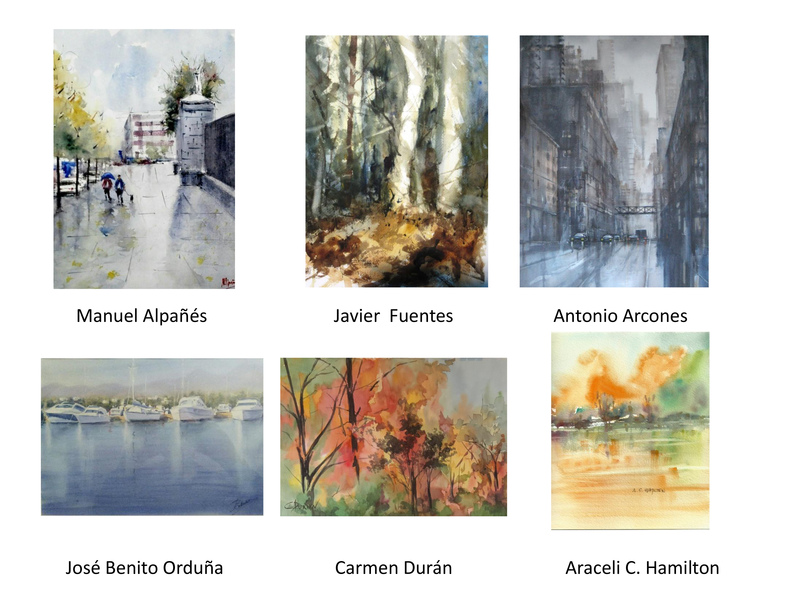 This entry was posted in Agrupación de Acuarelistas de España en Madrid, Exhibitions, Fine Art, Interior Design, Landscape, Open Air Painting, painting, Spain, watercolor and tagged art, exhibition, Fine Art, Forest, grapes, home decoration, interior decor, Interior Design, Landscape, love, Madrid, painting, Spain, spring, still life, watercolor. Bookmark the permalink. Great post , Victoria. Thank you for sharing.